Suzhou’s most festive season kicks off with North American sweepstakes. New York, NY, February 17, 2019 --(PR.com)-- The Chinese New Year has begun, and in the scenic city of Suzhou, locals and visitors are celebrating through traditional means such as enjoying decorations welcoming the Year of the Pig, savoring family dinners featuring dishes thought to bring good luck in the year ahead, and attending local festivals. Chinese New Year is part of the annual Spring Festival which runs February 4 – 10, 2019, but travelers lucky enough to visit Suzhou can find Chinese culture year round in its UNESCO World Heritage designated classical gardens and Kunqu opera houses, on its winding canals, and beyond. 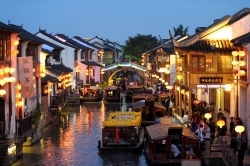 Those dreaming of experiencing Suzhou’s rich heritage and 2,500 years of history can enter the Chinese New Year Sweepstakes sponsored by Suzhou Tourism in partnership with SheKnows.com. During the duration of the sweepstakes, which is live now through 11:59pm EST on March 7, 2019, Suzhou Tourism’s social media channels, including Instagram, Twitter, and Facebook, will feature dedicated posts sharing the beauty and wonder of Chinese New Year and the Spring Festival in Suzhou. Travelers can enter the sweepstakes by visiting traveltosuzhou.com/cnysweepstakes. Suzhou Tourism also encourages all travelers visiting the city during the Spring Festival to share their photos on social media using #TravelSuzhou. For more information on Chinese New Year and other festivals and events in Suzhou, visit traveltosuzhou.com/things-to-do/suzhou-festivals-events. Details on travel packages to Suzhou can be found at www.traveltosuzhou.com/tour-packages. Travel to Suzhou is easily accessible via three convenient area airports with non-stop flights from North America: Shanghai Hongqiao International Airport (SHA) offers bullet train service to Suzhou, which is approximately a 50-mile, 30-minute trip; Pudong International Airport (PVG) is approximately 65 miles from Suzhou, an hour and half drive; and Sunan Shuofang International Airport (WUX) is approximately 14 miles from Suzhou, a 30-minute drive. For more information on Suzhou please visit www.TravelToSuzhou.com and follow the destination on Instagram, Twitter, YouTube, and Facebook.